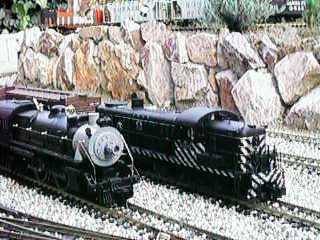 These two engines are among my current favorites. The RS-3 is a well detailed and fine running engine. The Atlantic is another story. It has been a "project engine" as I have really torn into it. Its had its motor remounted, 3 lbs of lead added, its power pickups replaced, the driver axles shimmed and the pilot truck wheels replaced (Dean Lowe). Marker and cab lights have been installed and the cab is detailed. It now has a train crew as well. There is a P&H sound system in the tender which also has Dean Lowe metal wheels and power pickups. An Aristo ART-5474 in the tender controls the sound system. Kadee couplers are installed fore and aft. The engine has been repainted and relettered. All it needs now is some weathering. After all this work, its now a fine running and reliable engine. See Lionel Atlantic Tips for more information on how I bashed this engine.